Mold is a fungus that can cause health problems, such as allergic reactions, skin irritation and more. Mold occurs indoors where there is excessive moisture, as where leakage may have occurred in roofs, pipes, walls and other areas where there has been flooding. The Insurance Information Institute explains that many building materials encourage mold growth and that large mold infestations can usually be seen or smelled (Source). 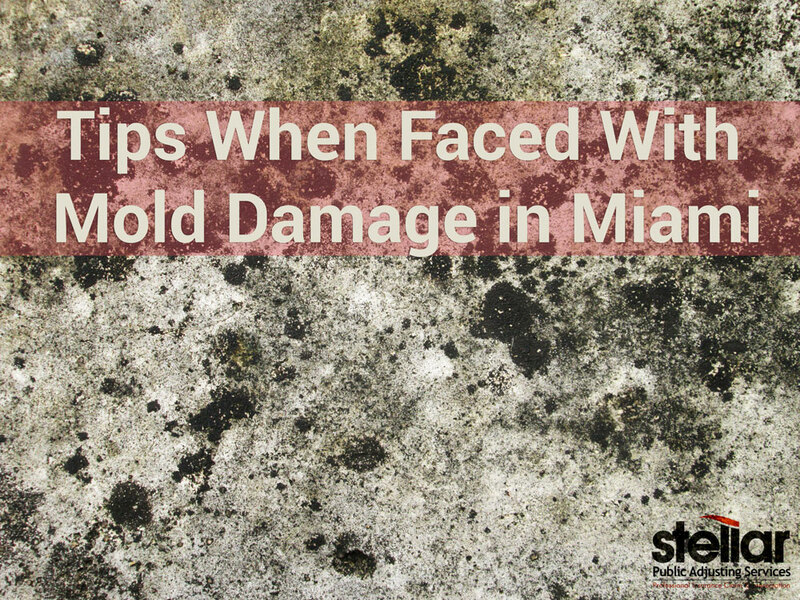 Unfortunately, mold damage is common in South Florida. If you suspect mold in your property, know that mold damage insurance claims are complex, because of exclusions or limitations related to mold that are found in most insurance policies. Water damage does not have the same insurance policy limitations as mold. Therefore, in the case of mold damage, it is very common that water damage is the claim filed and mold damage is filed as the tangential cause. Understanding and making the most of your insurance policy limitations is a key reason to hire Stellar Public Adjusting Services when mold or water damage is discovered in your property. When our clients ask us for help settling a mold damage claim, our first priority is to investigate whether the mold damage can be linked to water damage for which a claim may be made under the insurance policy. If the mold took hold after a pipe burst or after water intrusion due to rain, then the mold damage claim may be tied to water damage, in which case we can make a strong argument that a mold exclusion should not apply. 1.Take mold contamination seriously. Molds grow best in environments that are warm, damp and humid – conditions which perfectly describes life in South Florida (Source). 2. If mold is discovered, remove all persons with health problems out of the property. And do not eat, drink or smoke near the affected area. Mold spores can cause serious respiratory problems. 3. Contact Stellar Public Adjusting Services immediately to review your insurance policy and to begin filing your insurance claim. You don’t want to be stuck with a lowball offer from your insurance company! 5. Protect your property from any further damage, but do not make any permanent repairs. Avoid the affected area: do not remove or move any contents, attempt to dry any moisture with a fan or open any windows to let the airborne spores out. 6. Document your loss and damaged property as thoroughly as possible. 8. Research your insurance company’s contractor before allowing them to do repairs. 9. Get professional help if you need it! Stellar Adjusting can help with all aspects of mold damage insurance claims. 10. Make sure you know all the deadlines that may cut off your right to file a lawsuit. 11. Report any unfair claim handling. If there is mold growth in your home or business, you should call Stellar Public Adjusting Services immediately on (305) 396-9110. We can connect you with a mold remediation company that can help extract the mold, kill it and treat the area so that the mold has a lesser chance to develop again.